and in your chamber, and be still. The fact that astronomies change while the stars abide is a true analogy of every realm of human life and thought, religion not least of all. No existent theology can be a final formulation of a spiritual truth. 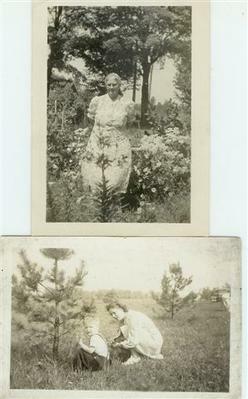 The old photos are of my country grandmother in her garden, and of little Dickie learning about the flowers from Mom. "Here's a subject for an essay for you. One of the girls at work recently moved to a house on the Fluvanna Townline Road. She and her husband have a fairly large lot and she has been exploring the property. She came to work one day last week and said she had found some wildflowers and didn't know what they were. She described them as little yellow bells with funny spotted leaves. I said right away that they must be Adder's Tongues. She then asked me how it was that I happened to know this stuff, because the week before someone else had said they noticed a patch of woods on the way to Warren that was filled with white flowers. I've noticed the same patch for years and said they were Trillium. I was amazed that so few of the people at work knew what a Trillium was. Anyway, it got me to thinking about the family springtime walks in the woods in Frewsburg. Do you remember where we used to go? All I remember is that we used to drive out Frew Run Road or Bone Run Road or somewhere in that vicinity. We'd park by the side of the road, walk uphill through a field and into the woods. And there we would find Adder's Tongues, Hepatica, Spring Beauties, Trillium, and May Apples. If we were lucky, we'd find a Jack-in-the-Pulpit, but the rarest of them all was Trailing Arbutus. Do you remember any of this, and do you have any idea where it was? "By the way, I looked up Adder's Tongue in my Audubon Wildflower book, and there it's called either Trout Lily or Dogtooth Violet. It says that the Adder's Tongue is a pink variety found only in Minnesota. Now why do you suppose Mom called the yellow ones we have here Adder's Tongues? "P.S. I'm still wondering how your radiation treatments went. What's the next step?" Ann and I often are struck by the value of having had parents who maintained at least some connection with roots stretching back into the 19th century. We wish they had preserved even more, but the pressure of middle class membership in the 1950s was powerfully involved in being 100% average American. They really went for that, but fortunately had enough quirks of individuality to give both of us a different understanding of the world around us than the radio and TV told us to have. Many of our colleagues at work throughout our careers do not have parents like ours, and therefore fit in better and look at us weirdly when we bring up something like Adder's Tongues...the younger ones, who like to mow everything in sight, especially. That farm, out on Oak Hill Road, was the focus of many a Sunday drive for us kids...and I still go out there whenever I return home, taking my children with me. There's not much left of the buildings now...and the orchard is in total ruin. My mother used to weep whenever she saw the apple trees untended even 50 years ago. Our mother's tears were frequent and plentiful...and understandably many of them were in eternal mourning for her father, whether she knew it or not. But somehow they also were connected with the passage of time, the seasons, and a love of Nature so strong and pure that we kids simply took it in like air and water. Father lovingly took us on tours of her old rambling pathways at least a few times a year. The Spring search for the Trailing Arbutus was an annual affair. Frewsburg is about 5 miles southeast of Jamestown, in the Town of Carroll, which is the most southeast township in Chautauqua County. I understand the word "Chautauqua" is the language of the Seneca inhabitants of the land, and means "sack tied in the middle," referring to the shape of the prominent lake that dominates the life of the county. The Town of Carroll is bordered on the east by Cattaraugus County, which must be another Seneca name, and the State of Pennsylvania to the south. When we took our drives we went around through there. Oak Hill Road runs east into Cattaraugus County, and generally that's the way we went, turning north at the end of it and onto the road where, a couple miles further, the Trailing Arbutus grew...and probably still does. I'd need my Cattaraugus map to identify that road, but it's out in the garage somewhere---and we don't want to think about the mess the garage is in just now. If Ann drives out there today, she may find it from ancient memory...but I still know where it is, and we'll see it when I come up there this summer, though it won't be blooming then. I'm not as good with the names of flowers and trees as I am with birds and insects. I don't know why. Boy stuff and chasing around maybe. And some of it may have to do, as Ann notices, that a flower in one part of the world can be named something else somewhere else, and that makes it all confusing. Flowers also have heavy connotations about them sometimes...and maybe I leave it to women to know all those romantic and emotional images. There's a fascinating book called "The Meaning Of Flowers," by Claire Powell, that was published in London in 1977, and over here almost immediately by Shambhala(!). In it we learn that during times like the Victorian, when women might faint at the mention of a word like "flesh," flowers were sent in letters to convey different messages of emotion and intent. What a particular flower might mean, should you receive it pressed in a book or letter, is defined and the flowers shown in brilliant woodcuts. Apparently the language of flowers is even more pronounced in Oriental tradition. Ann mentions the Trout Lily. Why would that flower be called that? We think it's because the pattern of coloration on the leaves looks a bit like that on a trout. The Dog's Tooth name comes from the shape of the root. I don't know about the Adder's Tongue, but maybe it's what Swedes called it since that's the name in Minnesota, although there aren't any adders in Sweden. I remember being confused when I moved to New England, and had to learn Trout Lily instead of what Mom called them. I was thinking just yesterday, as I walked through our woods, where did the Rattlesnake Orchid get its name? Everybody says it's because of the pattern on the leaves, but did somebody name it that when they became afraid they were stepping on a rattler out there? There seem to be more impenetrable mysteries in the names of flowers than in those of---say---butterflies, at least for me. Maybe that's another reason why I don't know them so well. Perhaps you all know the one about the Forget-Me-Not. Mrs. Powell is most thorough in her book. She says that Victorian English used to travel all the way to Luxembourg to see this symbol of true love in full flower. It was most abundant on the banks of a small stream there at locations called the Fairies' Bath and the Cascade of the Enchanted Oak. Can you imagine such places? She says girls used to dance on a carpet of blue flowers, and make wreaths to wear from the blossoms. Tennyson wrote of "The sweet forget-me-nots, That grow for happy lovers." But the origin of the name is fraught with disaster. "The story began in Austria. Two lovers, on the eve of their marriage, were walking on the banks of the Danube. A flower, blue as the deepest sky, swung upon the waves, which seemed ready to bear it away. The young lady admired its beautiful colour and sighed that the flower was to be swept away. Her sweetheart leapt into the river to retrieve it, but the fast waters overcame him. With a desperate effort he threw the flower on the bank, and then sank back, crying with his last breath, 'Love me. Forget me not!'" (p. 73) Over on this side of the pond, always-hungry Americans found the thing didn't taste good...and we named it that so you'll remember not to eat it. Enjoy the Springtime! 1 May 2005 @ 11:20 by jstarrs : Wonderful! Brought me back to the Sunday outings my parents would take me on out of London into the woods around Caterham looking for mushrooms with the other two (communistically bound) families who accompanied us. My Dad loved mushrooming, wildlife etc. Just before he died, he took on a little job of warden looking after a hill near where they'd retired. My sister and I scattered his ashes up on top there. When I was recently in Jacqueline's garden, in the Ardeche, she had borage plants dotted about in the gardens. These plants have quite powerful medicinal values and their nickname is "Drives Away Sorrow". Borage is the symbol of bluntness and rudeness. Since that characteristic drives everything away, not only sorrow, how come the "medicinal" value? It seems borage is used, in England particularly, in all sorts of cocktails...particularly the gin sling, which has it wrapped around the glass! She thinks that in moderation, booze helps us drive sorrow away...but after a few, we may get into an argument, a fight, a brawl...and eventually thrown out of the pub entirely. Thus we end up with rudeness. Better not tell Jacqueline all this stuff. 1 May 2005 @ 18:04 by hgoodgame : This made for great reading! I'm always amazed at people who have lived here all their life still not knowing the native plants. We also have trilliums in the woods in early spring. Forget-me-nots are another wildflower here and one of my personal favorites. 2 May 2005 @ 14:05 by jazzolog : Is That A Blue Flag? Remarkable photo Heidi, and thanks for the comment. Not sure how you got such good focus with that shot. You're north of me aren't you? And yet you've got iris in bloom. We've got a few going around here, but mostly we're just budding, including the flags which often come first. Nice forget-me-nots! We're covered down here, and I must confess the thought of dancing on them has crossed my mind. Often violets and forget-me-nots are mixed together here, blooming in the same spot at the same time. Delirious! ...are knows as Irises this side of the pond. For a change my hands were steady, probably, but the blue flag is much more purple than it looks here. Don't know if I'm north of you or not, I'd have to look at an atlas, but the west coast is more temperate than the east and right on the ocean makes for an even milder climate. You're right, the wild violets (which are yellow) are blooming now also, as well as cultivar violas. Here's a neat idea, plant tulips under the forget-me-nots, they make a nice contrast and bloom at the same time. I have to wait until next year for mine. I shared the forget-me-not story yesterday, it just came up because my daughter-in-law wanted to know what the little blue flowers in her yard were, so it was all serendipitous! Artificial Grass Suppliers Quickgrass based just outside Birmingham supply high quality Artificial Grass Products. Fake grass or Artificial Grass is supplied all over the UK.